It's a question that has consumed scientists and motivated space programs for decades. 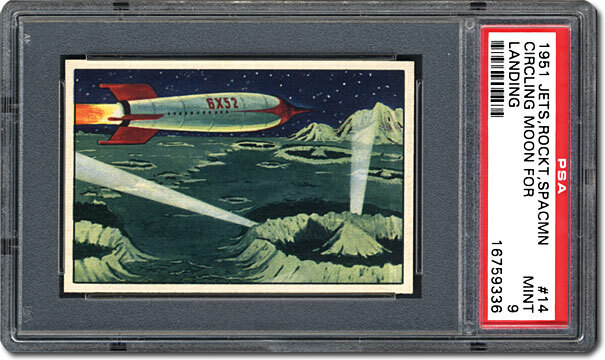 It was also the inspiration behind the 1951 Bowman Jets, Rockets, Spacemen (JRS) set, a popular series that follows Dr. Zara, Captain Argo and their crew on an exciting trek through space. 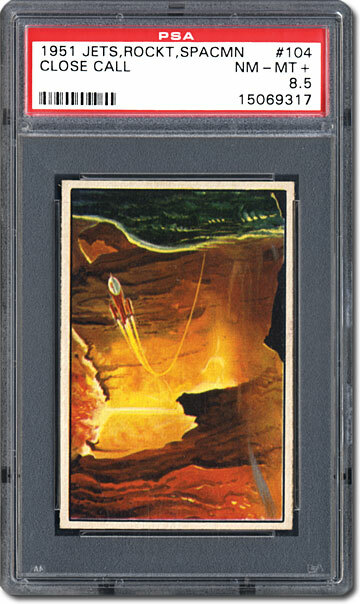 "When these cards were initially released, people believed that there was life on other planets in our solar system," explained Kurt Kuersteiner, webmaster of www.monsterwax.com and www.monstercards.org. "This set was created when labor was cheap and imagination was plentiful. Television was still new and everyone, for the most part, read books and listened to radio dramas." Aaron Michiel, who owns the No. 4 Current Finest JRS set on the PSA Set Registry, expresses similar sentiments. 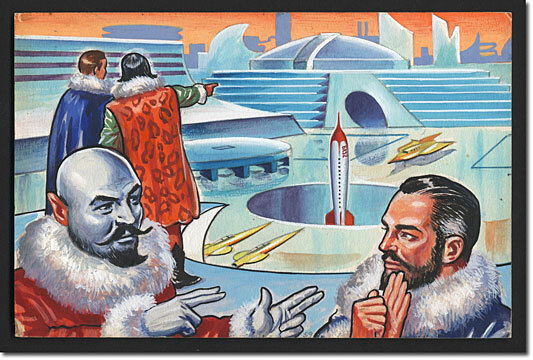 "The story on these cards was just incredibly imaginative. 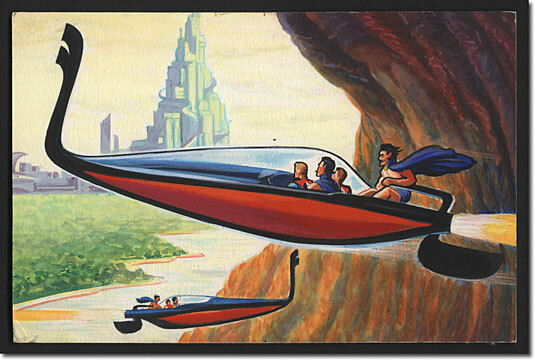 Sixty years ago, this is what they thought the future of space travel would be," he said. 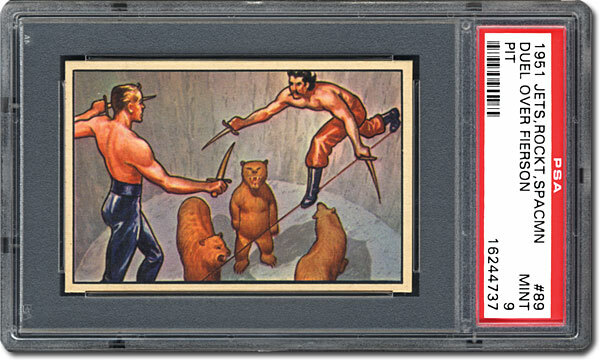 The George Moll Advertising Agency, of Horrors of War fame, was responsible for the lush artwork in this 108-card series, while Gordon Palmer penned the story. 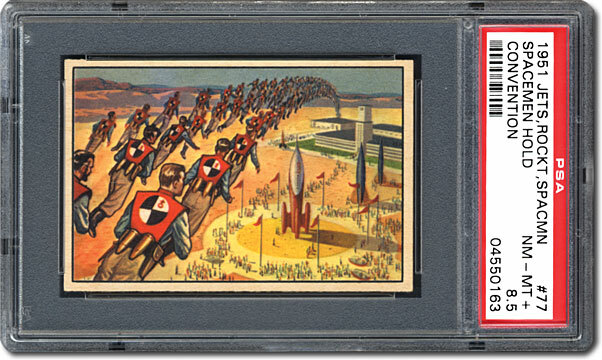 The bulk of the first 72 cards describe the exploits of the 6X52 rocket crew. While trekking between planets, the team overcomes, among other obstacles, meteor showers, a giant space blob and space pirates. 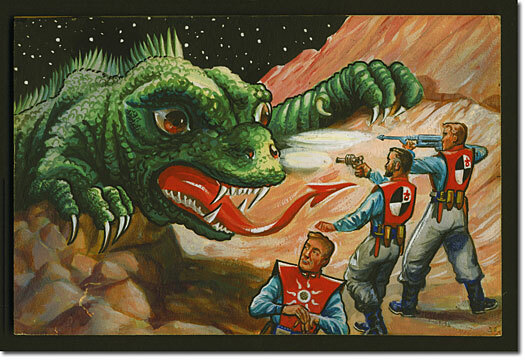 And with creatures like fire beetles, hypnotizing steam frogs, mantis men and saber-toothed tigers awaiting them, the crew finds little safety when landing on the planets. 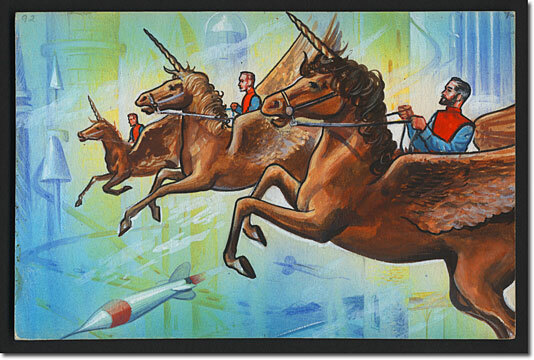 "That was the joy of the Jets, Rockets, Spacemen set, it was very entertaining. The crew didn't spend any tedious time waiting in spaceships," noted Kuersteiner. 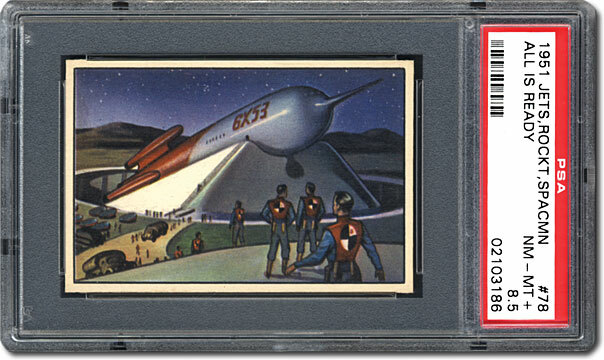 Employing a new spacecraft – the 6X53 rocket – the crew takes off for the Sirius solar system in the third series (#73 to 108). Again, the crew faces adversity. On this voyage, they encounter brain men, are shrunk into dwarfs and are menaced by vegetable men. It's no wonder that these cards were a sensation amongst kids when initially released. 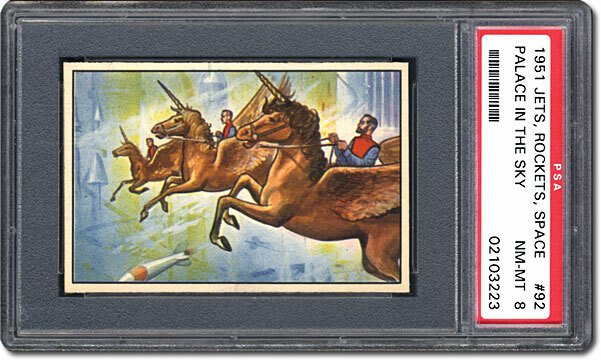 "I remember when I was six or seven years old, a couple of the cards showed up in old cardboard boxes that my friends had and I was fascinated by them. They were completely different than anything I had ever seen," said Bill Bengen, who owns the No. 2 registry set. Ronnie Paloger, whose registry set boasts an incredible 8.14 GPA, earning a 2010 PSA Set Registry Award for best non-sports vintage set (1948-1959), still has the five JRS cards he amassed when he was a kid. 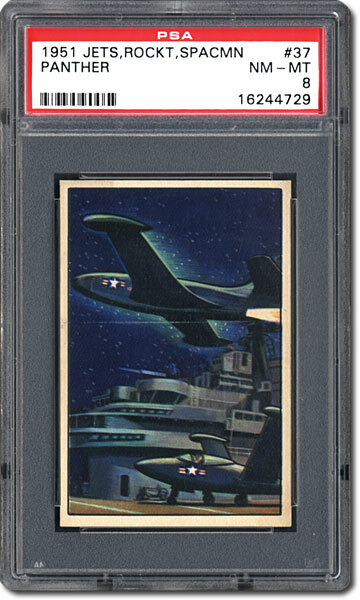 "I was only two years old when these cards first came out, so I certainly didn't collect them when they were available. But I got them in some sort of flipping trade in New York back in the 1950s," he recalled. 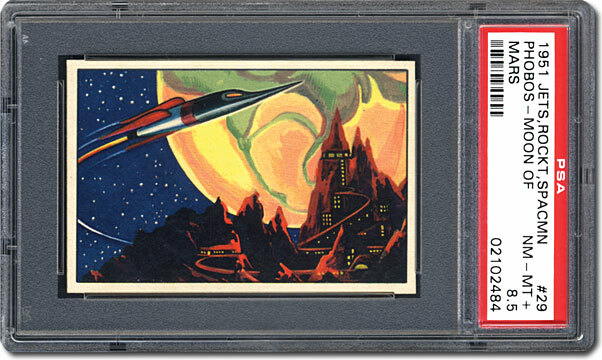 "Every time I looked at those cards, they always stuck out because they were science fiction and they were different than the Davy Crockett cards or Zorro cards that were taken from TV. These cards were cool. They were different, they had great artwork and they were interesting to look at." Marty Quinn, owner of the No. 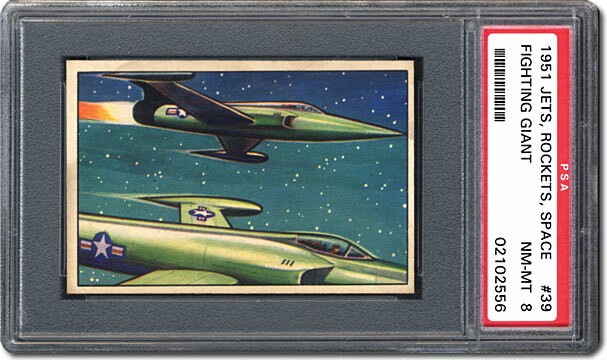 3 registry set, says that Bowman released these cards at a time when kids were fascinated by space travel and jets. 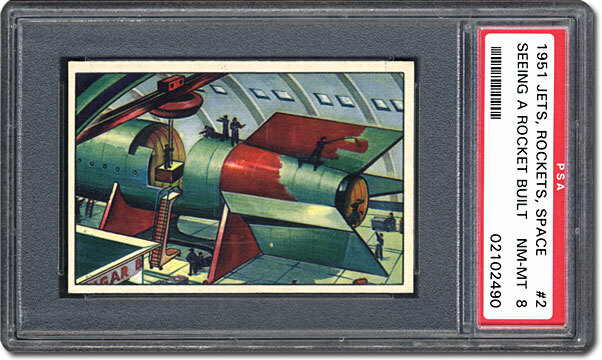 "When Bowman decided to put jets and rockets on these cards, it was perfect for that time period," he said. 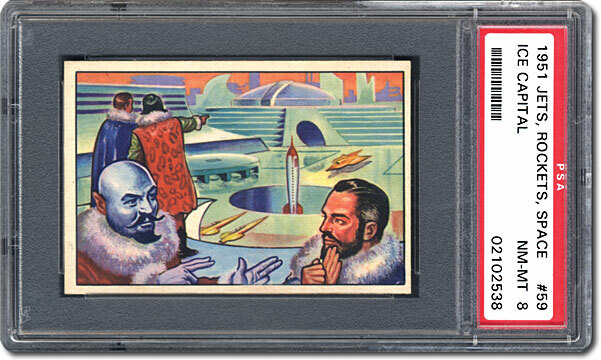 Each card in this set measures 2-1/16" by 3-1/8" and the artwork by the George Moll Advertising Agency continues to draw raves. "The artwork was just so beautiful," said Michiel. "It was just so tremendously detailed." "It's amazing to think that these artists sat down and worked on this in such fine detail," he said, adding that he also owns eight of the original art boards of these cards. 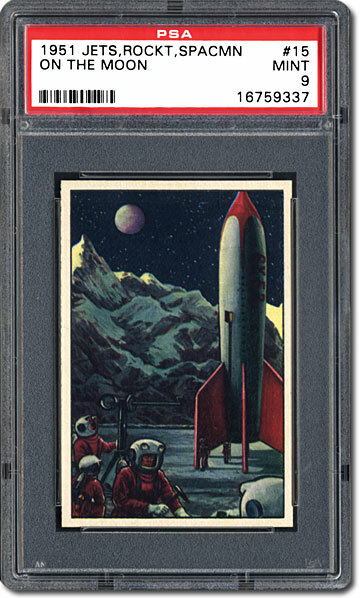 The captivating, continual story on the card backs also appeals to collectors. 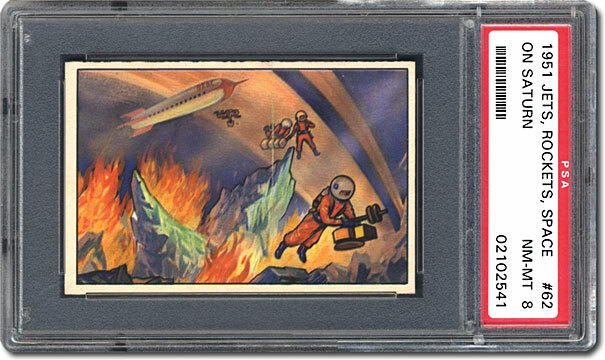 "It's almost like each card is a cliffhanger, if you're missing just one of these cards, you're going to be disappointed, unless it happens to be one of the jet cards," noted Kuersteiner. 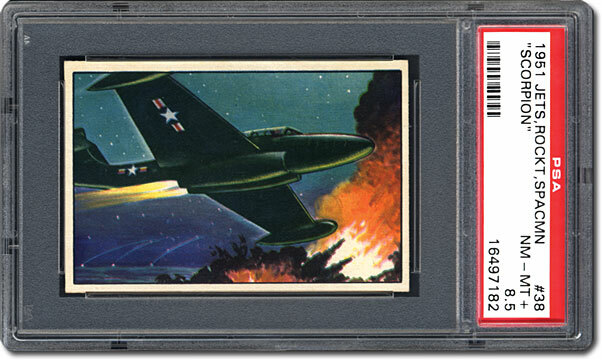 The jet cards (#34 to 39, #106 to 108) showcase photos of fighter jets and are not related to the exploits of the space crew, but they are popular amongst collectors. 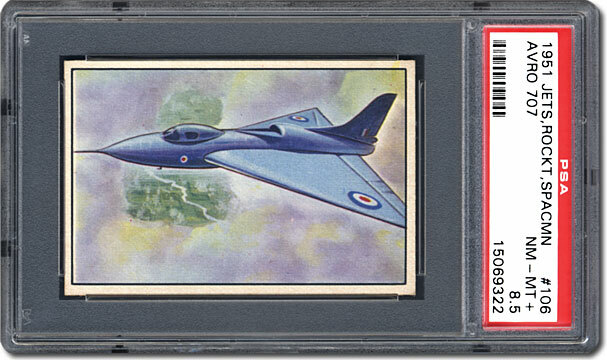 "I'm still at a loss to explain why they bothered to throw in (the cards of) modern day jets. I'm not sure why they didn't stick to a space theme," said Bengen. "It was like they didn't have confidence that a space theme could carry the set." 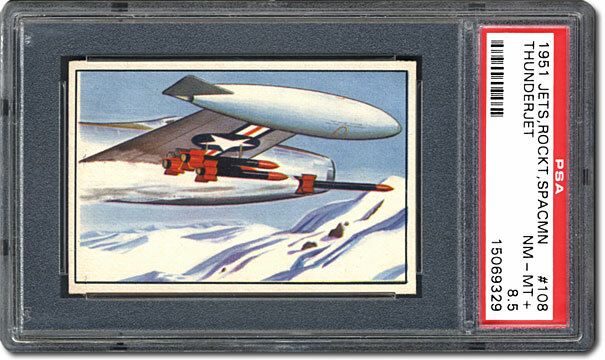 Hobbyists note that second series cards (#37 to 72) are generally tougher to track down than cards in the other series. "If you look in the Population Report, you will see how few PSA NM-MT 8s there are for cards #37 through 72," said Paloger. Bengen adds that the third series cards (#73 to 108) are also more elusive than the first series. "The first series is fairly easy to get in nice condition, but the second and third series are brutes," he said. 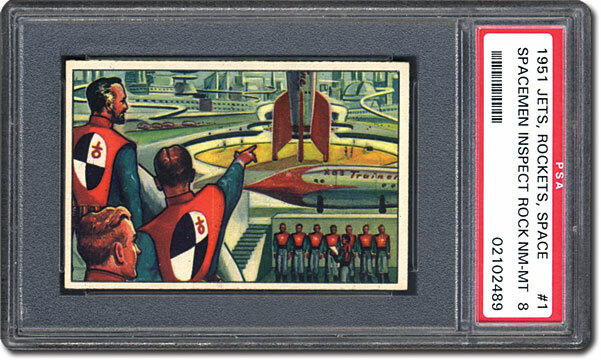 Of course, this set was originally supposed to be 180 cards – or five, 36-card series. Unfortunately, the fourth series artwork was lost. 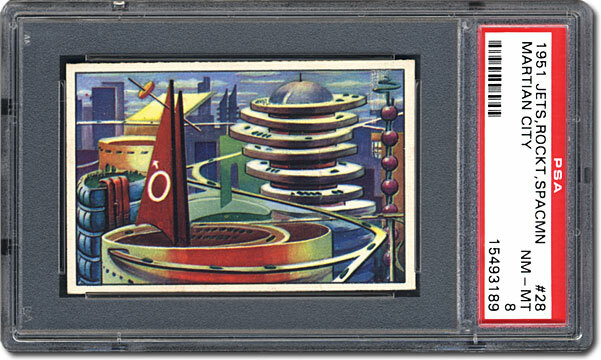 A note on card #105 Malpo the Mighty indicating that its story would be continued on card #112 offers evidence that a fourth series was, indeed, planned. "It's very plausible that the fourth series could've been lost," said Kuersteiner. "You could get all of the artwork done, put it in your attaché case, head off to Bowman to show them the finished pictures and you leave the attaché case on the subway and it's stolen. This is a major setback. Now, you've done the writing. You've done the sketches and you had the finished artwork and it's been lost. To redo it at that point is going to take months. You could see the company saying it's just not worth redoing it." 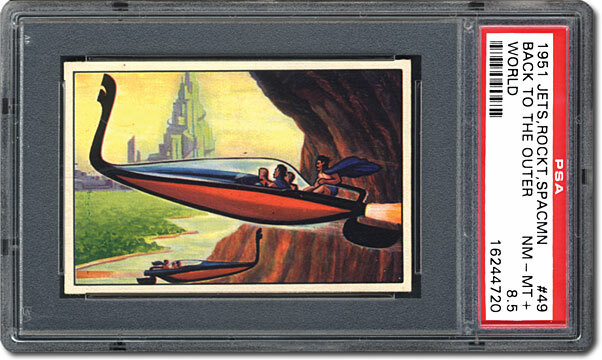 Hobbyist James Trever recovered most of the artwork from the fifth series (#145 to 180) in 1980. Together with Paul Koch, he parlayed that find into the creation and release of the fifth series in that same year. Just 2,000 of these sets were created. Each set also contained a few pages of text that provided the missing fourth series story line. 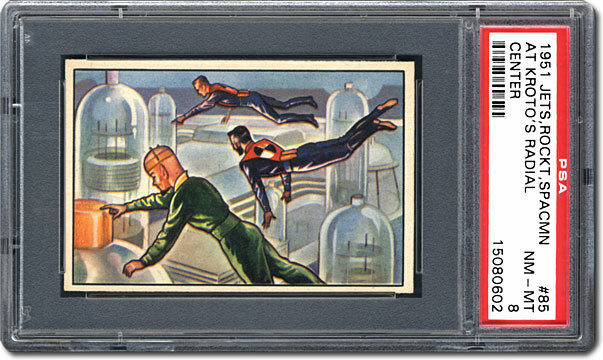 The original 108 cards were released in one-cent and five-cent packs. The one-cent packs are much more common than the five-cent packs. "I've never seen a five-cent pack," said Michiel. 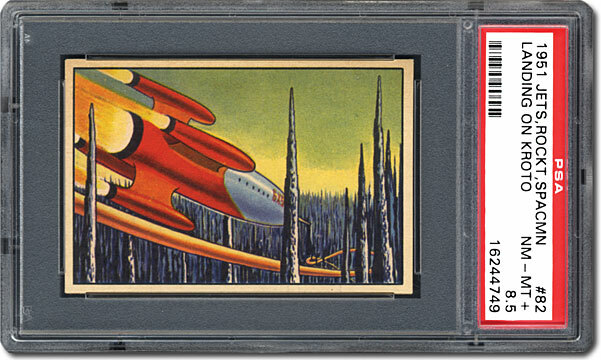 Experiencing financial difficulties in 1955, Bowman also reportedly reissued wax boxes of this series in an effort to raise money. 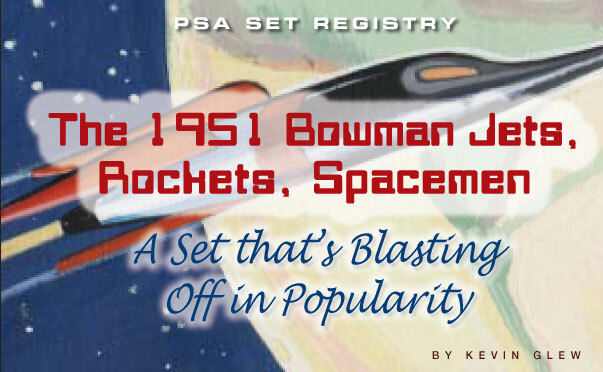 The number of hobbyists pursuing this set on the PSA Set Registry has increased dramatically over the past couple of years. Quinn says that up until two years ago, there were only two or three sets registered. Today, there are 18. Paloger's passion for the set was evident when he paid $28,440 to acquire what was the No. 1 registry set at the time in 2009. 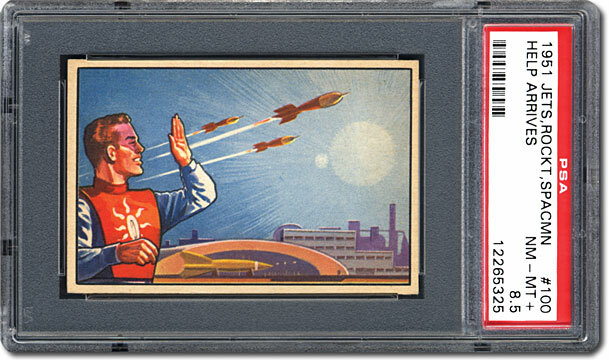 He has since further upgraded his set, which now includes the only two PSA Gem Mint 10 JRS cards and is the only set ever to boast a GPA higher than 8.00 on the PSA Set Registry. 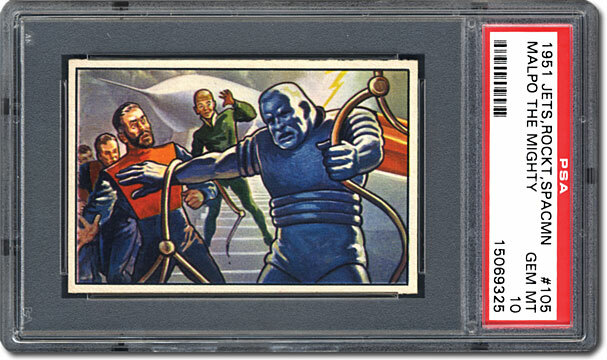 The devoted collector says that the price of graded singles is based on the PSA Population Report, the lower the number of high-grade PSA examples a card has, the more it's likely to command. 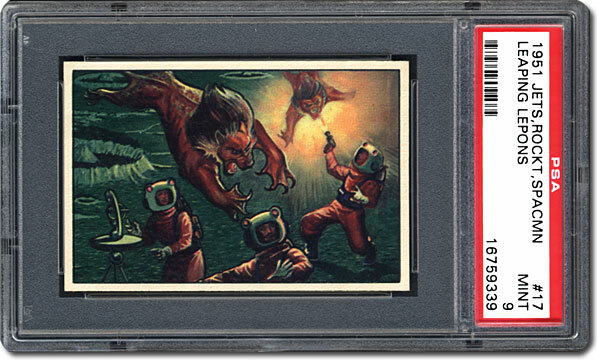 With just 13 submissions each, the #37 Panther and #40 Spaceman Examine Wreckage cards are the two lowest population singles in the series. Not surprisingly, these two cards are part of the scarcer second series. 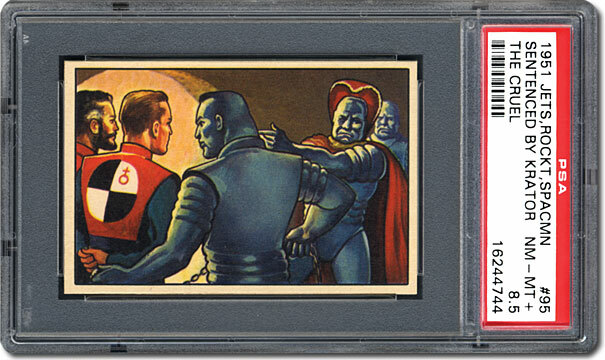 "Just about any card from that second series in high grade will get cosmic prices," said Bengen. 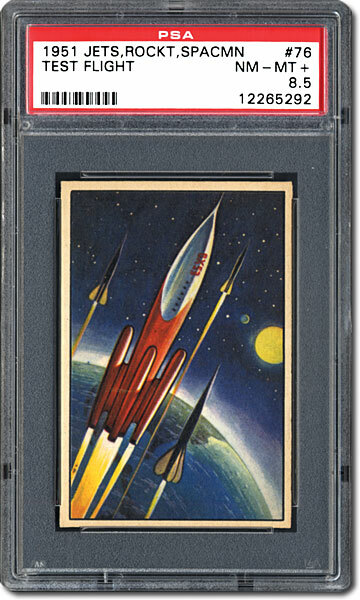 Paloger added that the first card (Spaceman Inspect Rocket Center) and last card (Thunderjet) also tend to command a premium. Showcasing a picture of a Cleveland Indians player, card #91 (Videoscope) is another coveted single in this set. "There has been a lot of debate over the years over who that player is," explained Quinn. "People have said it's Larry Doby of the Cleveland Indians. That seems to be his batting stance as well. When I look at it, I consider it to be the Larry Doby card." 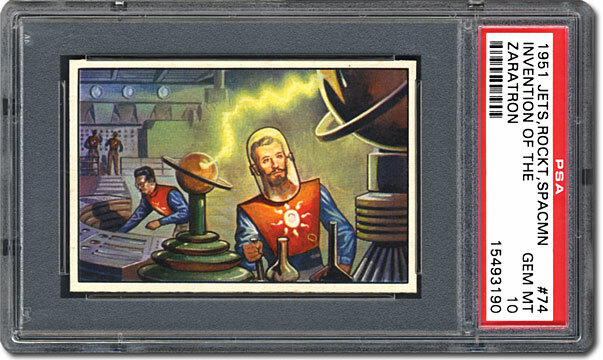 Toning and poor centering are among the condition issues that seem to hamper cards from this series. Michiel adds that, in his experience, most of the cards with wax stains are in the third series. But, while collectors attempt to track down the original cards in top condition, there is also some exciting news about the fourth series. 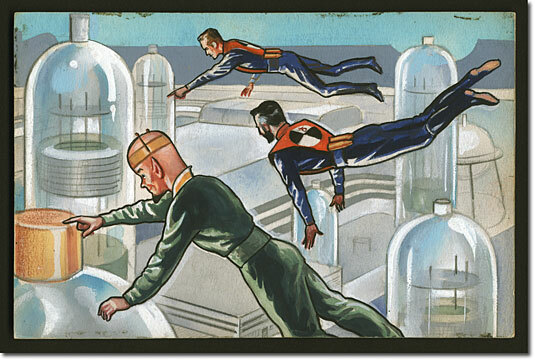 Kuersteiner is working with Trever, who was involved in producing the fifth series, to create the missing fourth series cards. "An artist is working on the fourth series now," said Kuersteiner, who isn't sure when the new cards will be ready, but collectors can likely expect them within the next couple of years. Meanwhile, Paloger believes that the original cards will remain popular. "I think the demand for these cards will continue," he said. "It's one of the greatest non-sports sets ever created. These cards were way ahead of their time." 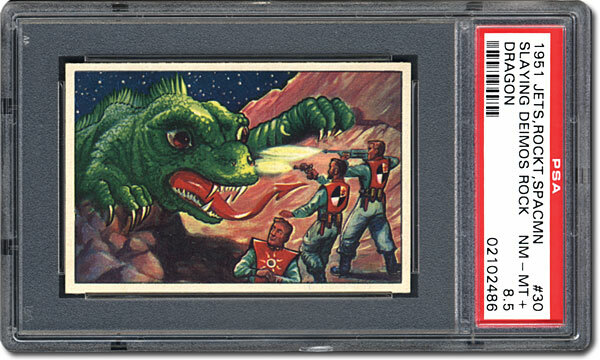 "This set is right up there with Mars Attacks as one of the best overall card sets ever produced," he said. "In some ways, I would say it's better than Mars Attacks, because Mars Attacks was basically a rewriting of War of the Worlds. 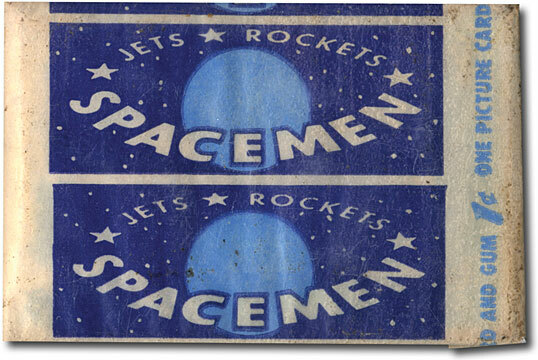 Jets, Rockets, Spacemen is much more original." Please feel free to contact Kevin Glew at [email protected] if you have any additional information or comments. Ronnie Paloger and Marty Quinn provided pictures for this article. Please note that the Population Report figures quoted and Set Registry rankings reported are those as of press time.